I apologize for the delay in posts, life (and a bad case of food poisoning) got in the way! I thought I would come back with a bang with this amazing pasta dish. When writing this recipe I tried my best to think fall and I think it is safe to say I accomplished this! I have to admit, I have never been a fan of kale. While everyone was jumping on the bandwagon, I was running away from it. I initially thought spinach for this dish, which could easily be substituted, but when I got to the store this day, kale was on sale, just begging for me to buy it. I am not going to lie though, the other flavors in this dish definitely help me disguise that I am eating the kale! I do however love squash of all kinds. Butternut squash is probably one of my favorites because of it's versatility. 3. Place the butternut squash on a rimmed baking sheet. Pour the 2 tablespoons olive oil on the squash. Sprinkle with salt and pepper. Toss to coat. Bake in preheated oven for 25-30 minutes, or until the squash is fork tender. 4. While the squash is roasting in the oven, add the pasta to the salted boiling water. Cook until al dente. Drain pasta and set aside. 5. Brown the sausage in a skillet until cooked through. Drain on a plate lined with paper towels and set aside. 6. In a separate sauce pan, melt the butter and add the 2 tablespoons of flour and garlic over medium heat. Whisk constantly for about 2-3 minutes and do not let the mixture brown. Slowly add in the 1 1/2 cups of heavy cream and bring to a simmer. Reduce the heat to low and whisking often, cook until the mixture thickens to the back of the spoon. Remove from the heat, season with salt and pepper and add the parmesan cheese. 7. 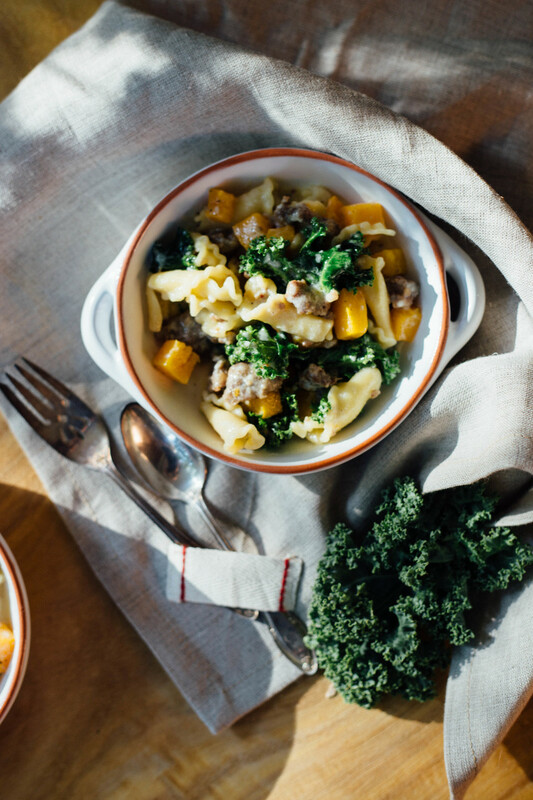 In the large pot that the pasta was cooked in, toss the pasta, sausage, squash, and kale. Pour the cream sauce over the pasta to coat. Pour the pasta in a baking dish and bake in the already preheated oven just about 15 minutes until the pasta is warmed through. If the dish is heated to your preference, you can just skip the baking! 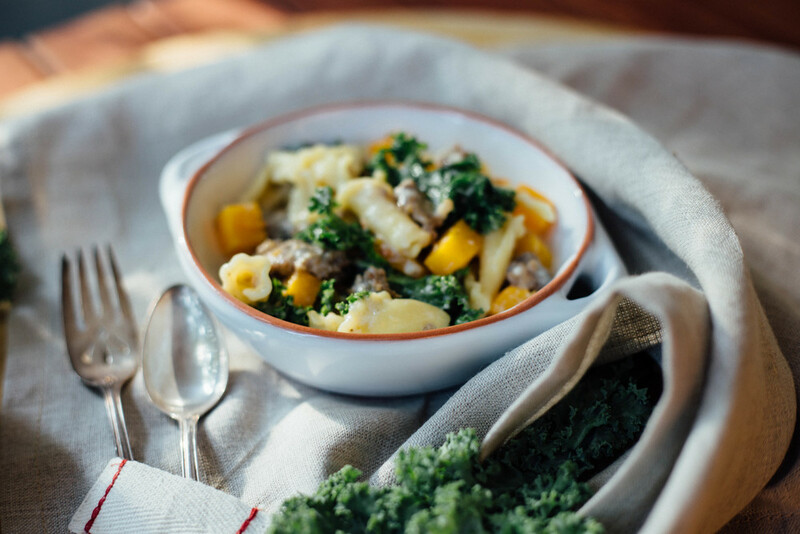 Don't shy away from the kale like I did, go out and try this delicious fall pasta dish!